The animated feature has changed quite a bit in the last few years, as traditional hand-drawn techniques gradually give ground to computer generated imagery. Pixar have stayed ahead of the game by putting as much focus on character and story as they do on the technicalities of the animation, but the trail they blazed has also resulted in the likes of Shark Tale and Madagascar, which may well work for some but frankly left me shuddering with horror. The latter in particular had visuals so pared down that I couldn't help suspecting that speed and economy were the project watchwords – hop back to 1996 and you'll find better looking animation on the intro sequence of the PlayStation 2 game Pandemonium. I'm well aware that my complaints are at least partly nostalgia driven, a sadness for the decline of the artistry that shaped the animated films of my youth and allowed us young amateurs to first experiment with the medium. But it's also the hand-made element of drawn or stop-motion animation that allowed artists to make the jump from static to moving imagery without drastically changing their working methods, resulting in animated shorts that were challenging, artistically thrilling, and completely the work of their creator. And it may be the nostalgia talking again, but I miss the tactile feel and rough edges of hand-crafted animation, imperfections that have to be designed and programmed into their modern day computer equivalent. Even then the results are slick enough to prompt those raised on it to regard the earlier material as primitive by comparison. Which is a real shame, because if you look beyond the mechanics of the animation you'll find a boldness of experimentation and sophistication of ideas that its computer generated cousin has yet to catch up to. 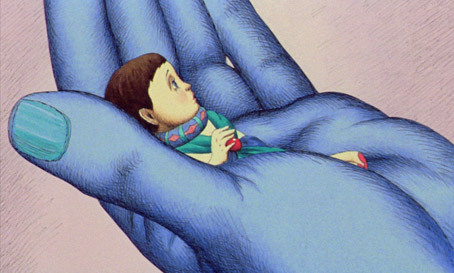 Which brings me to La planète sauvage, aka Fantastic Planet, a 1973 animated feature whose animation certainly lacks the smooth sophistication of modern CG imagery, but whose design, themes, concepts and storyline are a genuine wonder to behold. For a good many years it was the only René Laloux film that I or a good many others had seen, and was the only one I remember getting a UK cinema release of any note. It was unlike anything I'd seen before, and at the time of its 2005 Masters of Cinema DVD release I was still championing it as unique. At this point I'd yet to see Laloux's final film, Gandahar, which was also released by Masters of Cinema, along with his 1982 Les maîtres du temps [Time Masters]. After this I stopped talking about La Planète sauvage as a unique film and began referring to it as a masterwork from a unique and visionary artist. As is our way with new versions of previously covered releases, I don't plan to re-review the film itself – if you're new to it then you can read the original DVD review here. The focus here is on the Blu-ray upgrade, and an upgrade this is, with a new transfer and more extra features than on the DVD. The DVD version of La planète sauvage was one of those rare Masters of Cinema transfers whose quality did not quite live up to their own self-set high standards, something I attributed largely to the condition of the source print. There was thus clear room for improvement in the Blu-ray upgrade, and happily that's just what we get, with the new transfer superior to its predecessor in every respect. The image is brighter, with considerably more picture information in some darker areas and a warmer feel to the image in general. The colours are richer, but subtly so – the red eye of a Draag on the DVD appears to be the same colour on the Blu-ray, but somehow seems almost to shine here, as if it's been cleaned up and polished. The dust spots that peppered the DVD print are all gone, and the higher resolution results in a crisper image, noticeable in the definition of the ink lines of the drawings, though this is tempered by artwork that avoids hard edges and employs a soft colour scheme. Overall, a fine job. The DTS-HD Master Audio mono 2.0 track shares the DVD's slightly narrowed dynamic range, but is louder and slightly brighter than its predecessor. The US English dub that appeared on the DVD has been retained here and is of similar volume to the French original, but has slightly less finesse on the voices and some of the sound effects. If you're expecting the Blu-ray release to feature the same extras as the DVD only in 1080p, you'd only be partly right. Both of the short films included on the DVD – the 1965 Les escargots and the beautifully designed and animated 1987 Comment Wang-fo fut sauvé (you can read more about both in my DVD review), but have been re-transfered here high definition. Les Escargots in particular has undergone a considerable upgrade, having a cleaner, more stable picture and very good colour, while the detail on the line work of the facial close-ups is really crisp. Also included is the 1988 short La prisonniére (6:33), which had previously appeared on the DVD release of Gandahar. The transfer here is similar to the one on the DVD, and may well have been sourced from a tape original (diagonal jaggies are occasionally visible) – it doesn't display the same level of sharpness as Les escargots. The soundtrack is still a little muffled, as it was on the DVD version. All 25 tracks of the Alain Goraguer Soundtrack music have once again been included to enable you to fill your house with an otherworldly atmosphere while you go about your daily chores. But wait, there's more. René Laloux's first two short films have also been included, both of which appeared on the 2003 DVD from Force Video but are making the MoC debut here. Les dents du singe / The Monkey's Teeth (1960 / 13:51) is a cut-out animation whose screenplay, backdrops and characters were devised by patients from the Cour-Cheverny psychiatric clinic at which Laloux then worked, a process briefly outlined in a live-action opening. This tale of a man who visits a dentist and has all of his teeth removed against his will for delivery to a paying customer is peppered with surreal touches, from shape-shifting policemen to the cycle-riding simian avenger of the title. I'm guessing the engagingly primitive artwork was also created by the patients, or at the very least based on their drawings. 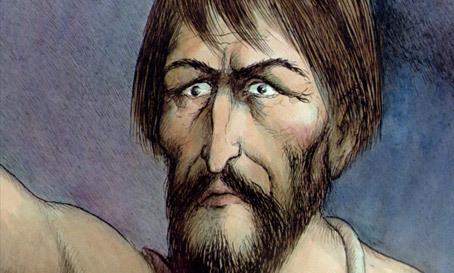 Les temps morts / Dead Times (1964 / 9:47) marks Laloux's first collaboration with artist Roland Topor, the man primarily responsible for the distinctive look of La planète sauvage. It's a sober and committed anti-war piece constructed largely of Topor's drawings, a few of which are animated and cut with live action footage. Both this and the above film appear to have been sourced from video originals. Laloux sauvage (2003) (26:17) is a 2003 interview with Laloux in which he outlines how he made the move from psychiatric worker to film animator, with clips from his early films and contributions from producer André Valio-Cavaglione. Appropriately for this disc, the troubled production of La planète sauvage is covered in some detail, while his later films are given little more than a passing mention. Laloux himself is an intriguing interviewee, revealing that Les dents du singe was the work that gave him the most pleasure, that he prefers the art of suggestion to the art of revelation, and that he regards modern films as the work of paranoid dictators. In keeping with the rest of the package, the typically fine Booklet is also an upgrade on its predecessor. Craig Keller's essay The Schizophrenic Cinema of René Laloux has been ported over, but is joined here by a 1973 interview with Laloux from the French press book for La planète sauvage, some sketches for the film by Roland Topor, and credits for all of the films on the disc. Easy one, this. If you don't yet own the film then this is the version to get, and even if you have the previous Masters of Cinema DVD then I'd recommend upgrading, for the improved picture quality and the additional extras. No question, this is the best home video version of La planète sauvage on the market. Highly recommended. * René Laloux's description of La planète sauvage.